Home » Pain » Could Wearing a Splint Help with Carpal Tunnel? 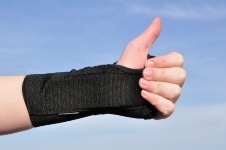 Could Wearing a Splint Help with Carpal Tunnel? Carpal tunnel syndrome, or CTS as it has been nicknamed, can create quite a lot of pain when it flares up. And this pain often lingers for days. Resting sometimes helps, but more likely than not, as soon as you start using your hands and wrists, chronic pain will return. While there are some alternative remedies for CTS, many people still turn to pain-relieving drugs to mask their pain symptoms. RECOMMENDED: Some great tips on a few exercises you can perform. Before you go that route, however, you might want to consider applying a splint to your wrist. This is a somewhat controversial home remedy that the medical community has largely dismissed. But recently, researchers in Melbourne, Australia have discovered there may be some merit in splinting when it comes to improving the symptoms of CTS. When you have CTS, one of the two main nerves in your wrist is compressed, which triggers the pain you feel in your hand, wrist, and sometimes arm. Splinting is often suggested to people with mild to moderate CTS symptoms. However, the effectiveness and duration of the benefit of splinting for the condition remains largely unknown. This prompted the Australian researchers to conduct a review of clinical trials to compare the effectiveness of splinting for CTS with no treatment, placebo, or other non-surgical intervention. The review included 19 studies and 1,190 participants with CTS. Two studies compared splinting with no treatment; five compared different splint designs; one compared different splint-wearing regimens; seven compared splint delivered as a single intervention with another non-surgical intervention; and five compared splint delivered in combination with a non-surgical intervention to another non-surgical intervention. One study conducted on 80 wrists found that, when compared to no treatment, splints worn at night more than tripled the likelihood of reporting overall improvement of symptoms at the end of four weeks of treatment. Another trial treating 90 wrists found that wearing a neutral splint (which allows the hand and wrist to rest in a “natural” position) more than doubled the likelihood of reporting “a lot or complete relief” at the end of two weeks of treatment compared with an extension splint. If you’ve tried other treatments and are still experiencing CTS pain, give nighttime splinting a try. Get some help to properly position the splint. Page, M.J., et al., “Splinting for carpal tunnel syndrome,” Cochrane Database Syst Rev., published online July 11, 2012.